"You're looking at the most dramatic dish in New York, according to @pete_wells of @nytfood: Malibu sea urchin in a spiky shell that looks something like a medieval torture device. 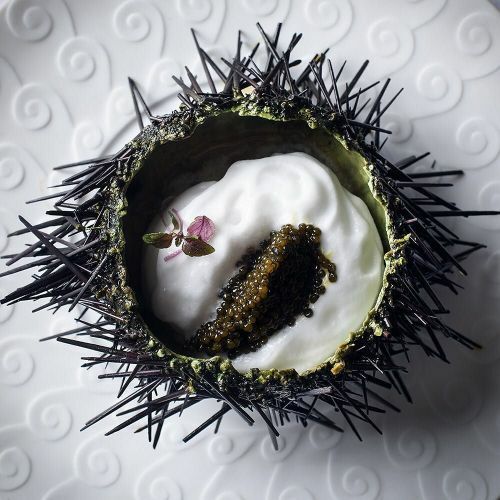 "Inside," Pete writes, "is a layered composition of almond and soy milk; tofu; soy and vinegar; yuzu jelly and bursting orbs of salmon trout roe; creamy tongues of sea urchin under yuzu sorbet; and an olive-green spoonful of golden osetra caviar. Swooshed around it all is a puckering froth of green apple juice." The @nytfood critic recently tasted the dish at Bouley in TriBeCa, "a slightly eccentric restaurant" that @nytimes last reviewed in 2009. Bouley, by @bouleynyc, is not trendy. It's a restaurant for romantics and sensualists (and those willing to spend $125 on a 3-course menu). #⭐⭐⭐" By nytimes on Instagram.